Perfect for the Easter table, this cocktail is light and refreshing so even if the weather doesn't work with us, we can mix up our own little glass of 'spring'. 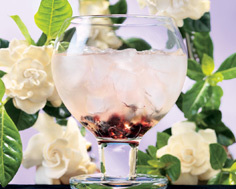 Place berries in a cocktail glass and mash slightly with back of spoon. Pour vodka and white grape juice into a cocktail shaker filled with ice. Shake and strain into glass and serve. What cocktails will you be serving at your Easter celebration?